Every summer, around July 4, a good friend of mine hosts a seafood-themed party. There are crabs, clams, and a host of other good food. For a number of years now, I have also worked with him to create a series of homebrewed beers for the party. John found an old soda fountain machine that he has retrofitted to dispense beer and the guests have several to choose from. You can read posts about the beer brewed for the party in 2010, 2011, and 2012. 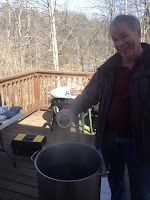 This past weekend marked the first brew day for the summer party. While it may seem funny to start brewing for a summer party when there is still snow on the ground, we really need to start this early to account for scheduling and resources. I have a limited amount of fermentation space, so we need to plan to have only have beer that ferments at the same temperature hitting that space at the same time. We also account for beer production and aging time, so that the product enjoyed at the party shows its best. Then there is finding time to get together for brew days amongst our busy schedules. All of these factors go into the planning process, and certainly not for the first time, I am glad my friend is an engineer. Saturday's brew day went well. John and I brewed and oatmeal stout and hit most of our numbers. We have dubbed the beer "The Experiment" for a number of reasons, some of which will be documented in future posts. We enjoyed hot scotchies, good beer, and good food. Days like these remind my why I love this hobby so much. Have you ever had to schedule homebrew production to support an event? If so, leave us a comment. Jeff and I love to hear from our readers.